The causes and effects of allergies have long been known and can be a serious health threat. One controllable culprit in the battle is the household dust mite, a microscopic insect which is found in our indoor environment. The bedroom is particularly vulnerable as we spend a large portion of our lives in bed and a good deal of our time dressing and preparing for the day. We shed skin cells (which are food for dust mites) into our sleeping environment, collected by linen, pillows, mattresses, upholstery and carpet. 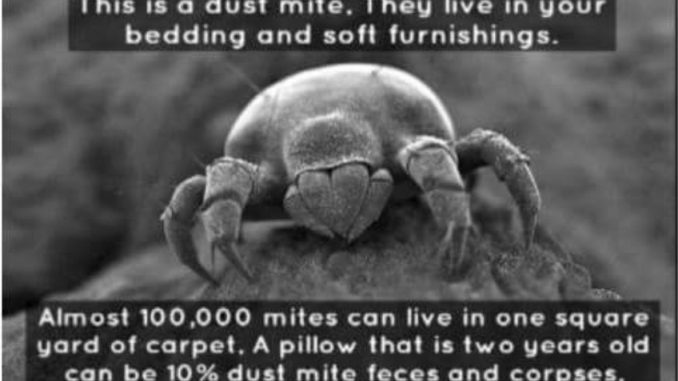 All are ideal breeding grounds for the household dust mite. Regular vacuuming only removes a small percent of the food particles that attract these creatures, whereas a High Heat, Deep Steam Cleaning can have a drastic affect on lessoning the allergic reaction. Our state of the art cleaning system combined with a specially formulated treatment is a must for every healthy home!